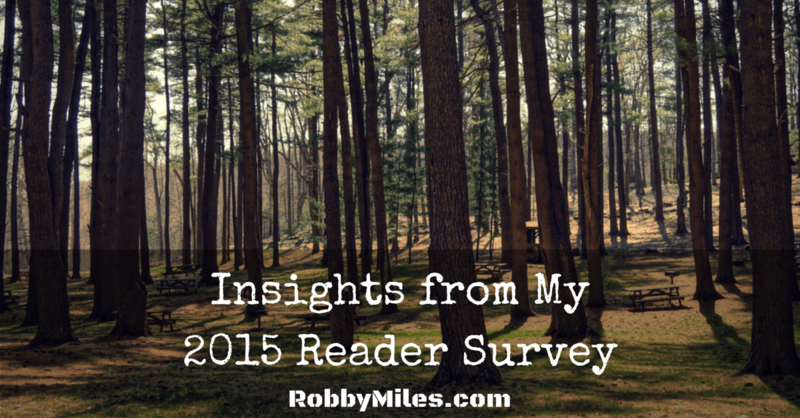 Two weeks ago I released my first reader survey. This survey has given me concrete data and insight into who you are and what you are looking to gain from this blog. You were also kind enough to share your biggest challenges. In short, it helped me see the forest and the trees. I’ve spent the past few days going over the data you shared and planning changes to reflect your responses. Now that I know who you are and what you are looking for, I can serve you better. Based on your responses, I put together a “reader profile” to help me explain who takes the time to read and interact with my writing. Below are the raw numbers what I got out of it. My typical reader is a male (70%) between the ages of 20-39. I am a bit surprised to see how high this percentage is. Don’t worry ladies, I will keep my content relevant for you. He would prefer to read new content (100%) instead of listening to a podcast or watching a video. He is active on Facebook (100%) and dabbles with Twitter (29%). Wow! I guess it’s true that everyone is on Facebook. If you haven’t liked my page yet, I encourage you to check it out here. He likes how posts are practical and to the point (80%). He is challenged by distractions (75%) and staying motivated in his daily work (75%). After taking a long hard look at your responses and keeping in mind my passions and talents, I’ve come to the following conclusions. Keep posts straightforward and practical. This was the number one comment. You liked the fact that the posts were to the point. Most posts could be used in everyday life with immediate application. Keep sharing personal stories & experiences. The most read posts on my blog are the ones where I share a short story or scenario I experienced. One reader commented, “I like how you bring up specific examples from your personal life…” I intend to share more of these types of stories to keep my content interesting and relevant for your day-to-day life. Keep writing mission focused posts. One reader commented that sharing military experience is valuable, but not necessary for every post. I have to admit, this was a sigh of relief. Moving forward I will keep this blog mission focused instead of military focused. In many ways this subtle shift will give me opportunities to share more stories (#2) and make my posts more practical (#1) in everyday life. Increase the focus on leadership. Most of you asked for this. You enjoy the self-development posts, but want to know how the information can apply to you as leaders in your careers and families. This year, expect to see a greater emphasis on leadership starting with leading your family. Update the meaning of self-development. I’ve always seen self-development as getting more productive and squeezing the most out of each and every minute. With your insights, I am coming to realize that self-development begins with physical, emotional, and spiritual training. I will continue to write about self-development and productivity, but I’ll adjust my focus to emphasize the importance of fitness, spirituality, and building strong relationships. If you participated in the survey, thanks for taking the time out of your busy schedule. This has given me insight into how I can help you become better leaders and achieve your goals. If you didn’t get a chance to take my survey, I will leave it open for you so I can continue to learn about my audience and keep my content relevant. You can find the survey here. Thanks again for your time and attention. Your help and commitment keep me motivated. With this motivation, I am able to focus my mind and master my mission to help others build and use the Mission Mindset.